Felice Gerwitz: I began homeschooling in 1986, because my special needs son did not fit into the tightly crafted public education “system” – they had mislabeled him and I couldn’t bear the thought of him going through school with a label that did not fit. I never looked back. I thank God everyday that he equipped me to recognize the error since my degree was in Elementary Education, Specific Learning Disabilities and Early Childhood Education. I also thank God that he showed me that homeschooling is a lifestyle, not what we do and as such, our foundation has been God first, and all else second. Felice Gerwitz: Legally we were scared to go out during the day because we didn’t want our kids turned in for truancy. The law was established to homeschool when I began, yet homeschoolers were heavily monitored by the county. In those days they visited our homes yearly to complete evaluation. After the first year the evaluation “team” included two ladies one was the science head of department for the school board, since the report must have read, “She teaches using science.” After the second year we quickly learned we could decline home visitations, and I did. My immediate family, the in-laws, had major reservations, even though my husband and I both held teaching degrees – neither of us wanted anything to do with the system, especially after we both experienced education from a teacher’s perspective. When we began text books were not readily available and I learned we had to “name” our school, create letterhead (this is before Microsoft Word) and use “official letterhead” to obtain these book. Once I ordered the book I learned I was curriculum impaired, I could not use a book the way it was designed so soon I began creating my own unit studies and used textbooks sparingly, even to this day. Felice Gerwitz: I helped form the first support group in town. It consisted of eight other Christian families. I was the only Catholic and yet once we established that I believed salvation was through Christ … I was in 🙂 I was part of the steering committee for about ten years and watched as homeschooling exploded in our area. I have served on the board of two, private Christian (non-denomiantion) homeschool ministries. I also, with the help and blessing of my husband, started a publishing company, Media Angels (R), Inc. with the purpose of writing Bible focused homeschool materials. Felice Gerwitz: I would relax. I was so hyper about doing what we needed to do each year for that grade that I missed some of those ah-ha moment. I finally figured that out about three years into homeschooling. Felice Gerwitz: Trends? First the proliferation of online state run schools that homeschoolers flock to in the name of free (sorry if I offend anyone here), second the push for Common Core and third an abdication of unit studies over printables and workbook type activities. I feel that many younger children learn so much more from hands on exploration and that is really how they grow and learn to love learning. If they are glued to a computer there is no interaction with the family and they will bond with the computer vs. the family. (You asked.) I think the trend is out-of-the-box and quick. I also see that many don’t care about creation vs. evolution. One friend, a vendor told me that in the past people always asked if the books contained evolution – he said now he rarely gets that questions. 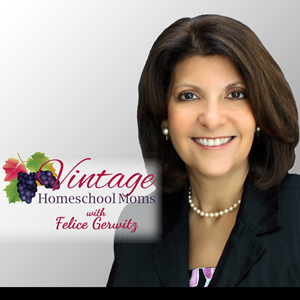 Felice Gerwitz: Wow! Let’s see – Jeff (my husband of 36 years) and I have homeschooled K-12. I’m so happy to report that all of my children love the Lord, are committed Christians and love family. We are very close knit. This is all by God’s grace and I am eternally thankful to Him, because I doubt I’d have this praise report if I had not homeschooled. I know many say, “homeschooling won’t save your child,” but earlier in this questionnaire I shared homeschooling isn’t what we did – it was a lifestyle. We took our kids seriously, spent time with them … did not go on vacations and leave our kids for extended periods of time. We just love God and our kids and He did the rest. My oldest son, 34 years old, with a form of Downs Syndrome, graduated from highschool, successfully and is fully integrated into society. He is very high functioning and has worked many jobs. Right now he has two jobs and does both efficiently. My second child, my 32 year old daughter co-authored a series of books with me while she was a highschooled student. She and I wrote three books (The Truth Seekers Mystery Series), and as of this writing have topped in the tens of thousands of books sold. She went on to complete college in three years and is now happily married for over ten years and has six children which she homeschools. My third child, a son who is 20 loved baseball and school came second. He decided, despite offers to play in college that he’d rather begin life and work, rather than endure school. He was a kid who was always fixing things – fixed my Kitchen aid mixer with a $9 part when he was fourteen. He is wired that way and love work. He is currently VP of my husband’s construction company and has plans to take over. My fourth child a daughter, is 17, and loves softball and school in that order. If she could figure out how to go to college and not do the school work so she could coach some day, she would. She hopes to play softball in college. As far as a major she wants to teach math – hopefully in a Christian non-Common core school-if one exists. My youngest is a son, is 15 and is very creative. He is a gifted athlete (baseball), as well as in academics. Things come easily to him. Too easily, which keeps me on my toes. I am at the end of my homeschool journey, my daughter is a senior and so is a freshman. Perhaps you think you’ve make the decision to homeschool – I believe you homeschool because you’ve been called. Homeschooling will change your life. It can either make or break your family. I’ve watched as many of my close friends decided to put their kids “back” in school for high school. I watched one friend after another do this … we prayed and stayed focused. We decided, we didn’t let our kids decide what they wanted to do. We (my husband and I) agreed were were the parents and the decision to homeschool was granted in the first place by the Lord. Lastly, be there for your kids above all else. This was a lesson I learned early on. When my publishing business first grew I was invited to many homeschool conferences all over the USA as a speaker – after the first three conferences, my husband said no, not outside of Florida and only when he could accompany me. I was upset and cried out to the Lord and asked, “Why did you give me this idea for curriculum if I can’t travel and share the idea?” and I felt a peace and the Lord saying to trust Him. He took my books everywhere without me. My books have been used throughout the US and even by missionaries in South Africa an beyond. I couldn’t do that, but the Lord did.